Olinda is named after Olinda Creek, which begins in the township. The creek was named in 1858 after Alice Olinda Hodgkinson, the daughter of Clement Hodgkinson, Victoria’s acting Surveyor General. The town was initially a logging settlement, however as land was made available for horticulture in the early 1900s, the town began to grow substantially. Berry farming, dairying, and flower growing became prosperous industries, and tourism soon flourished as it’s principal industry. In 1919 the Australian artist Sir Arthur Streeton returned to Australia and built a house on the property called Longacres, painting two famous landscapes of the area now on show at nearby R.J. Hamer Aboretum.One of the highest of the Dandenong Range’s villages, this popular tourist town is noted for its scenic beauty. The village’s gardens and scenery reflect its pronounced seasons, with spring blooms, autumnal colours, crisp summer days and occasional light snowfalls.Olinda Village is well renowned for its collection of craft and antique shops, boutique cafes and restaurants (including the famous German themed Cuckoo Restaurant, Ranges, Credo, The Ivy, Coonara Springs and Immerse at Olinda) and can be found at the junction of the Mount Dandenong Tourist Rd with Olinda-Monbulk Rd. Adjoining Dandenong Ranges National Park covers a significant area of Olinda, and offers visitors many walking tracks, – if you’re lucky, you may see native animals and birds, even the elusive lyrebird, BBQ and picnic facilities, as well as natural attractions such as the Olinda Falls.Many exquisite gardens can be found in Olinda. 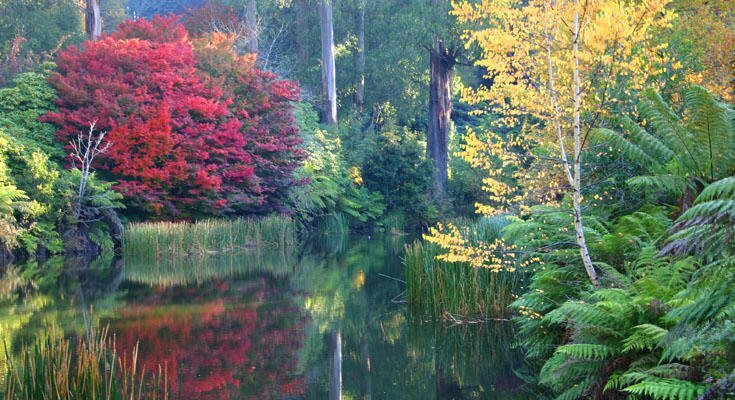 The National Rhododendron Gardens consist of 43 hectares of scenic parkland which feature blazing colours of daffodils, camellias, rhododendrons and azaleas during the Spring, set amongst lakes and lawns with lookouts, a cafe and display hall. To the east of the Rhododendron Gardens is the R.J. Hamer Arboretum which consists of a lookout and BBQ areas on Chalet Road and 120 hectares of native and exotic trees. 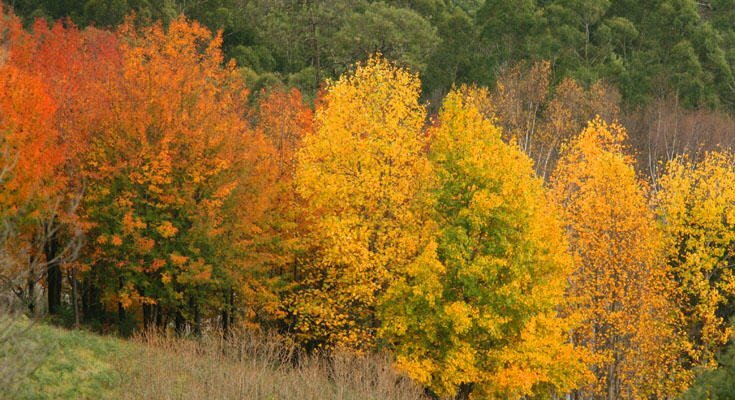 Following Silvan Road north through fields of wildflowers into the Dandenong Ranges National Park takes visitors to the popular Valley Picnic Ground and the secluded Eagles Nest Picnic Ground. Other worthwhile gardens to visit include the 11 hectare terraced Pirianda Garden and the Cloudehill Nursery which features formal gardens combined with a retail nursery and Lady Chatterley’s Restaurant which is situated in the middle of the Nursery and open only for lunch. 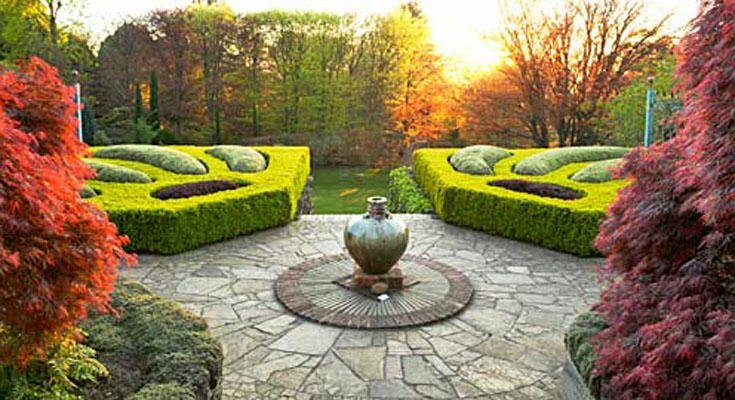 Don Burke of television show “Burke’s Backyard” fame even rated Cloudehill one of the world’s top ten gardens, which is a massive statement considering the beautiful gardens of the Northern Hemisphere. The Olinda Golf Course is one of the most scenic golfing venues in the area with views over picturesque Silvan Reservoir and the Warburton Ranges. Sassafras was named Sassafras Gully, after the trees which grew in the area. The land was opened to small scale farming in 1893 and a small township developed. The Post Office opened on 1 June 1901 and has always been known as Sassafras Gully. In the early 1900s tourism began to increase and the township consequently grew. Today Sassafras is a popular tourist destination with several boutique and antique stores, nurseries, and numerous restaurants and cafes such as Miss Marples, Ripe, Cream at Sassafras, Black Kettle Tea Rooms, Sassfras Cafe, Flippin’ Pancakes and Fortnums Restaurant. Located alongside Sherbrook Forest, the village of Sassafras is within comfortable driving distance of the scenic gems of the stunning Dandenong Ranges, the hilltop retreat on Melbourne’s eastern doorstep.For starters, the celebrated craft and antique shops of Olinda are just a few minutes by car, while the National Rhododendron Gardens are just a couple of kilometres up Falls Road. The gardens feature endless blooms of azaleas and rhododendrons set among native and exotic trees. Mount Dandenong was originally to be named Mount Corhanwarrabul, but due to the problems that were foreseen with the spelling and pronunciation of this name, the Surveyor-General’s office opted to name it Mount Dandenong. Though today there is still a Mount Corhanwarrabul, which is on the site of Burkes Lookout. The town of Mount Dandenong was settled in 1893, along with the neighbouring village Olinda which is only 800 metres away. By around 1900 the town had its own general store and primary school. In 1922 the first motorcars were seen in operation on Mount Dandenong. Today Mount Dandenong Village is home to a strip of boutique shops, a supermarket, and the Wild Oak, Indian by Nature, Fairy Mountain Chinese and Grinds and Vines Restaurants. Kelly’s Bar and Restaurant, the Pig and Whistle English Tavern and the Mount Dandenong Hotel are also located in this Village. The premier tourist attraction in the area and now the second most popular tourist destination in Victoria, is the Mount Dandenong Observatory.At 633 metres above sea-level, it is the highest point in the surrounding ranges. At the peak is the Sky High Restaurant, a cafe, BBQ and picnic areas, attractive formal gardens, and with spectacular views of up to 200 kilometres across Melbourne’s eastern suburbs, the city and Port Phillip Bay. Views can also be enjoyed from Burke’s Lookout at Mount Corhanwarrabul, about one kilometre south of the Mount Dandenong peak. Around 2002 it was proposed that the word “Melbourne” be erected in large letters at the peak of the mountain in the style of the Hollywood sign, visible from the city centre. However this was met with outrage from local residents and was not pursued. Access to Kalorama Park, which extends from the lookout and down a steep hill to Olinda Creek Road, is via Barbers Road. The park features a large rotunda, BBQ shelters, grassy picnic areas, colourful azaleas and rhododendrons, a variety of orchard trees scattered throughout the park, and several walking tracks. 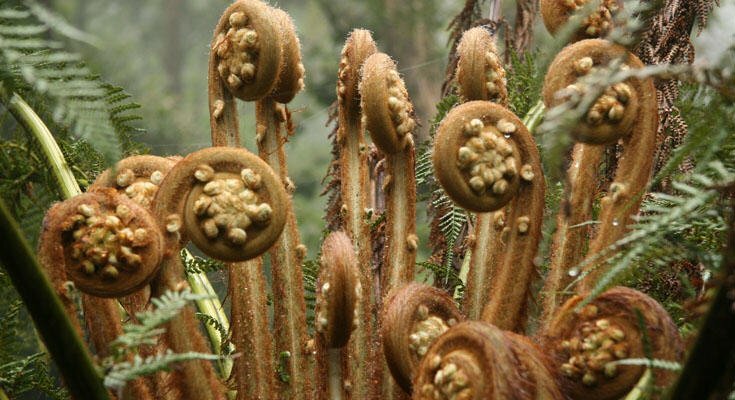 The Karwarra Australian Plant Garden, across the road from the general store on the Mount Dandenong Tourist Road, includes two hectares of landscaped botanic gardens featuring native wildflowers, floral displays, picnic areas, bush walking tracks, and an abundance of birdlife. Kallista is a small tourist village located 3 kilometres to the east of Belgrave. The heart of Kallista is located at the junction of the roads to Monbulk and Emerald and consists of a few speciality shops, cafes, and an attractive nursery. The community house in Church Street is the venue of the monthly Kallista Community Arts and Crafts Market which offers food, plants, craft stalls and entertainment. The Kallista Tea Rooms, just north of the town centre, is a popular place to stop for refreshments while touring the area. Kallista is surrounded by a number of attractive parks and gardens. Adjoining Sherbrooke Forest, which offers visitors walking tracks through native Australian bush in a scenic and mountainous environment. Opposite the forest on Sherbrooke Road are both the George Tindale Memorial Gardens and Alfred Nicholas Memorial Gardens which both feature an interesting collection of exotic plants. Just south of the town centre is Grants Picnic Ground which is where you will always see, feed and interact with all of the Dandenong Ranges Birdlife. Grants Picnic Ground have a kiosk that sells birdseed, souvenir shop, tea rooms, restaurant BBQ facilities, and walks along Hardys Creek. A lush and secluded picnic ground is located on Perrins Creek Road at the footbridge which crosses Sassafras Creek. Belgrave, first settled in 1851 was named after an 1840s chapel in Leeds, Yorkshire, England. Belgrave is linked to Melbourne via the Burwood Highway. The final 500 metre section of this road is known as Main Street, tightly winding itself through the town’s main commercial centre which is home to a selection of eateries, gift shops and the historic Cameo Cinema, all set against a forest backdrop. Ascend the ramp up to the Belgrave Town Park, on the north side of the main roundabout, for an elevated view over the town centre.One of Belgrave’s main attractions is the Puffing Billy steam train. 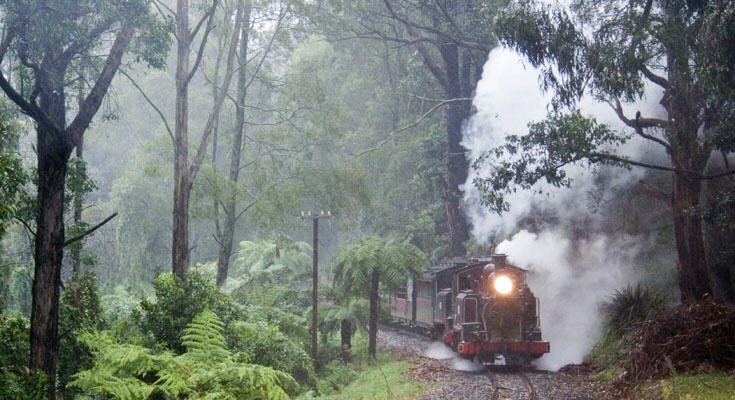 It is the oldest operating steam locomotive in Australia, taking passengers on a picturesque journey through the deep forests and fern gullies of the Dandenong Ranges. Passengers can enjoy a ride along any one of the track’s sections, disembarking at either Menzies Creek, Emerald or Lakeside, or they can stay on board and complete the full 25 kilometre journey to Cockatoo and Gembrook. Lunch and dinner options including meals in the dining carriage are available. One of the best spots to view Puffing Billy on its journey is just over a kilometre east of Belgrave at the viewing area on Gembrook Road where a long wooden trestle bridge carries the railway line over the adjacent creek and roadway. The Cameo Cinema, recently restored, has six cinemas, with Cinema 1 dating to the 1930s. There is an outdoor Cinema at the rear of the building, which is open only during the summer months (December to March). There is a music scene with live acts taking place at Rubys Lounge and the Scarab Bar. South of the town centre on Park Drive is Belgrave Lake Park which surrounds a small disused reservoir on Monbulk Creek. The park features walking tracks, BBQ facilities, a playground and grassy oval, set within a peaceful and heavily wooded environment. At the neighbouring small community of Belgrave Heights, off Mt Morton Road, is the Birdsland Reserve. Monbulk Creek runs through this reserve which includes a system of lakes, wetlands, well maintained walking trails and picnic/BBQ facilities. Following Mt Morton Road further south leads to the Baluk Willam Nature Conservation Reserve. It provides a valuable collection of local flora and adjoins the scenic Mount Morton Reserve. Gembrook located 12 km east of Emerald, is the eastern terminus of the Puffing Billy railroad line. 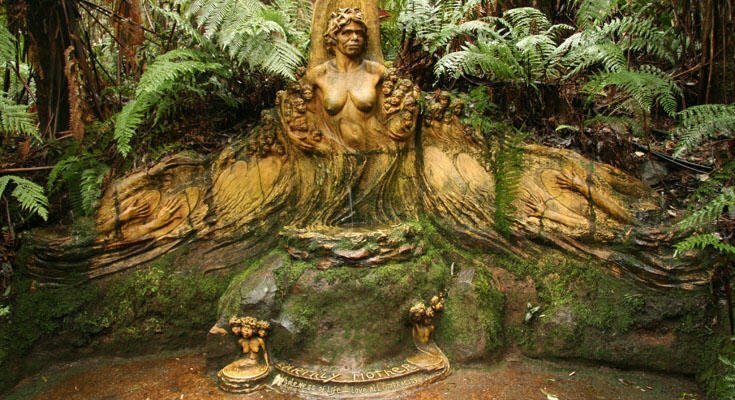 It was named after the Gembrook Mining Company which extracted gemstones from the area during the mid-19th century. Gembrook was first settled by Europeans in 1873. Timber felling was carried out to prepare land for farming. Saw milling became the main industry when Puffing Billy Railway came to Gembrook in 1900.In Gembrook today, potato, grape, chestnut and flower farms create a patchwork landscape, often with magnificent views of the distant blue ranges. Visit the historic Kurth Kiln, and Bunyip State Park just 7 kilometres from town, the perfect setting for a bush BBQ! In town you can visit the Motorist Museum, Historic Ranges Hotel, Blackwood Lane Art Gallery, old fashioned lolly shop and ice cream parlour, antique shop, gift shops and a range of eateries to cater for all tastes. 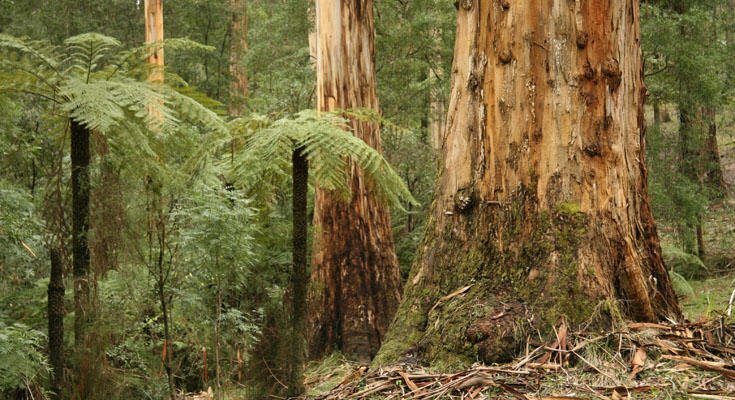 Five minutes walk from the village will find you in the Bushland Park, where a stroll along the nature trail will dwarf you among the untouched forest of towering mountain ash. A couple of minutes drive from the centre of town will also bring you to the stunning Forest Edge Restaurant. The Aboriginal name Monbulk translates as ‘hiding place in the hills’. The area was well known for being the site of Monbulk Preserving Company, now owned by Cadbury Schweppes, a jam factory, where Monbulk Jam was produced from locally grown fruit. Today Monbulk is a thriving township with many diversified farms growing fruit, nursery plants and a substantial bulb and cut-flower industry for national and international markets. Wickedly Delicious French Patisserie is a must visit locale at the corner of Monbulk Rd and Olinda-Monbulk Roads. Tesselaar’s Bulbs and Flower gardens host an annual Tulip Festival which runs from mid-September to mid-October when you can glory in millions of tulips, daffodils, freesias, ranunculi, hyacinths and anemones in full bloom.Rose fanciers can get their fill at the Roses Galore nursery which also offers barbecue facilities in a garden setting. Yarra Ranges Estate Winery in Coulson Rd and The Monbulk Winery in Macclesfield Rd are open weekends and public holidays for tastings while the main stream Five Oaks Vineyard in nearby Aitken Rd, Seville offers weekend and holiday visitors tastings and BBQs. Silvan Reservoir Park off Monbulk Rd is just one of a chain of tranquil bushland retreats where visitors can work up an appetite on the walking trails through cypress pine, spruce, liquid amber, maples and eucalypt forest before settling down to a picnic or barbecue lunch. In the 1860s a timber-cutter felled a stand of black-butts for palings, and the cleared area ten years later was found to be a grassed patch of land. It was named The Patch. A part of Monbulk has come under the locality now considered to be The Patch. The Patch is a very small suburb and consists only of houses, a Town Hall, a school, several commercial nurseries and a general store. Emerald was initially known as Main Ridge but was renamed after Emerald Creek which was, in turn, named after a murdered prospector. Prior to the arrival of Europeans the Woiwurung people are thought to have occupied the area. Gold was discovered here (and at Cockatoo located 6 km to the east) in 1858 and the town was planned the following year but the gold soon petered out and the settlement was slow to develop but eventually emerged as a service centre to a nascent agricultural industry.Today potatoes constitute the principal local crop. Australia’s oldest steam train railway, Puffing Billy, goes through the town on its trip from Belgrave to Gembrook. Classy Elevation Restaurant is well worth a visit.A ride on this train as it winds its way through the lush green forest is an essential Dandenong Ranges experience. The train station is located at pretty Emerald Lake, where there are paddle boats, walking tracks, tearooms, barbecues and picnic facilities, not forgetting the largest HO gauge model railway in the southern hemisphere.